A perfect combination of time and money, if you have always wanted to teach Pilates, GATEWAY is for you! Language: Cantonese Only, for English please see Iso Fit HK courses. You have heard about the benefits of Pilates. It greatly enhances the quality of life and health in those who practice and teach regularly. You know you would like to be a Pilates Teacher and at the same time you find the investment of time and money to be overwhelming at this stage of your professional development. Gateway Reformer consists of 2 sections. 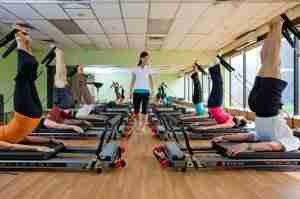 They must be taken in the following order: Gateway Pilates Online, Gateway Reformer. Students will receive a Certificate of Completion at the end of each course. Please note that these courses are Intro level courses and are not qualification courses. Completion of the Gateway Reformer component will enable the participant to go on to the full professional Reformer qualification. Preparatory and original Pilates exercises. The health and fitness professional who is interested in basic instruction in the use of Pilates Reformer exercises to supplement their current practice. From personal trainers, to to physiotherapists, this could be the perfect program for you. For those with limited time, limited resources or to prepare for a full professional Pilates teacher training.You know you want to become a Pilates teacher – this is the perfect first step on the road to full qualification. Teachers who want to add Pilates to their reportoite in order to get the best out of their students – Physical Education teachers, Ballet teachers can all add another string to their bow! For Pilates Enthusiasts who want to experience Pilates at a deeper level. This will enable you to understand Pilates exercise in greater detail, leading to improved and more effective Pilates workouts at the studio or at home. For Comprehensive Graduates who want to gain some knowledge of group (Mat or Reformer) teaching, and vice versa. Gateway Pilates Online (GOln - This three hour on-line training is a requirement for all who attend any of the Gateway Pilates training courses. The on-line course consists of three lectures: Pilates history and evolution, Polestar movement principles and professional ethics and scope of practice. Each of these sections is followed by a brief written exam on-line. Gateway Reformer (GRef) - This two-day Pilates experience will teach you how to provide four basic Pilates Reformer classes comprised of preparatory and original Pilates Reformer exercises. The Gateway educator will provide ample experiences for real time practice of each of the 4 Pilates Reformer sequences. Early Bird Discount of 10% if you register before the 29th Feb 2016. Early Bird Discount of 5% if you register with deposit payment before the 31st Mar 2016.